The most complex is often described best by the simple. The life we live these days is so strange and disjointed as to be nauseatingly complex. Even the wisest struggle to make sense of the current political scene. Add terrorism, mass shootings, police violence from both sides of the badge, and so much more, and my response is to break open a bag of chips and watch a movie. However, this is only a temporary distraction. Perhaps, seeing that which we can not change, there is a way to change how we see it. Which brings me to this simple song. There is a principle in science known as Occam's Razor, which, simply put, means the answer to any problem is usually the most simple, often called the "elegant solution." For instance, one of the greatest discoveries of all time, the relationship of mass and energy as expressed in Albert Einstein's theory of special relativity, E=MC2, is one of the simplest equations you'll ever see, but it resolves complex problems spanning the universe. So, we take this simple song and use a deeper meaning to resolve the problem of our complex modern living. Not completely, perhaps, but, hopefully, helpfully. "Row, row, row, your boat." Often when faced with unanswerable questions, and seemingly insurmountable challenges, we grab that bag of chips, and distract ourselves with some entertainment. And, when the bag is empty, and the movie done, there we are, still drifting along, and nothing has changed. We need to row, row, row, our boat. That is, do something. It might be merely a matter of expressing yourself on Facebook, writing a letter to the editor, sending out resumes. Just doing something -- anything -- can make you feel better. A letter of apology or forgiveness can make you feel a lot better. And sometimes, you even make a change, an improvement in life. There are two simple thoughts here: row gently, and row downstream. Struggle rarely is profitable. Hard work will get you results, but struggle, hardly ever. Struggle gets in its own way, while hard work carries you forward. Say you are trying to open a door that's stuck. You yank the handle, kick the door, yell and scream at the door and question its nonexistent parenthood; that's struggling. Or, you examine the door, determine the lock has to come apart, and then off, and you begin the process of dealing with rusted screws, and warped wood, and, with hard work, get the door open. Which method do you usually use? 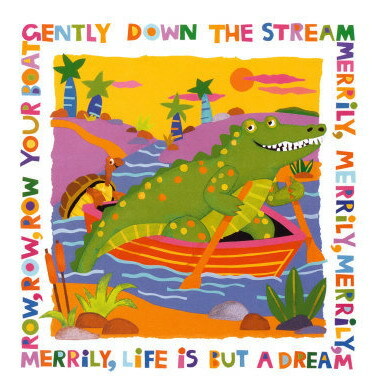 Row you boat, but "gently" down the stream. Which brings us to the second revelation: row downstream. Ever watched salmon swim upstream? Does that look like fun to you? And yet, we swim upstream way too often. This does not mean that you have to follow the crowd, and lemming-like, jump off the popular cliff. It means you use the flow to take you where you want to go. Consider the sailboat; it has to go with the flow of moving air currents, and yet, the sailor can tack with the wind and actually go the opposite direction, tacking back and forth. Another lesson of going with the flow, is to follow your guidance, rather than wrestling with it. Don’t deny it, fly with it. Or row with it. Give it a light touch. Continuing with the Facebook comment model, I sometimes find myself in an emotional knot, reading some comments that are laden with falsehoods and personal attacks. But, when I can remember, I give it a light touch, thinking to myself, “What an angry, pain ridden person,” which allows me to feel empathy for them and move on. This idea has moved me to stop watching TV news, and violent films. It’s hard to be merry when you are watching death and destruction for entertainment. It also moved me to spend time with other people who take a similar approach to life. I want to be with people who are “merry,” who lift me up. "Life is but a dream." Now we come to metaphysical answers for decidedly worldly problems, those seemingly insurmountable challenges in your personal world, and in the larger arena, a failure of society, of family, of the human race as a whole. How can there be so much murderous behavior in the world? The answer: there just is, and there always has been. It isn't any worse today than it has been all through history: The Dark Ages; both World Wars — all wars, actually — the unspeakable horrors visited upon our Native Americans and African Americans. There is nothing that I can find that excuses it, or dismisses it. But, if you believe that there is more to life than just this physical experience, then life can be seen as just a dream. If you believe that life is lived in the physical as it is, and is all that there is, that it all ends there, and there is nothing after, then there is no hope of a solution that I can see, and I have great empathy for you. I would rather believe in something after this life and be wrong, than believe that there is nothing, and be right. For one thing, I can only be proved right; if I'm wrong, I'll never know it. But, if I am right, then all of this, from creation to whatever is the final act of what follows, is a dream, or much like it. Nothing in this life will survive, nothing of the ugly, nothing beautiful; nothing at all. At some point, the sun, having burnt itself nearly out, will expand to or beyond the earth, burning it all to a crisp. The Mona Lisa, the works of Bach, the statues that inspire us, art that captivates us, music that enthralls us; all gone. That's the bad news. But, the good news — if you believe that something follows the reduction of everything to nothing — is that nothing dies; it all lives throughout eternity. For the ideas that produced the great works of art, music, painting, sculpture, every inspiring oration, loving touch and word, every good deed and loving action, will live as living ideas in the souls of everyone who has ever walked the earth. There is a line from a long-forgotten song, "Your sins, you will not remember, and all you will find there is love." This is truly what I believe. Life is but a dream, and when we wake, all of this, the madness, the meanness, the tragic and painful, will disappear as dew before the rising sun. And that which follows will be too wonderful for our poor human minds to comprehend. We must wait until our souls escape the bounds of our humanity, and expand into the infinite, and then we'll understand what it truly means, that "life is but a dream." I feel sorry for Donald Trump. Wait! Stop throwing things! Permit me to explain. Disclosure: personal opinion follows, flavored with a bit of a personal rant. Read further at the risk of emotional tweaking. First of all, Donald Trump is woefully inadequate to fill presidential shoes (he has small feet, y'know). He would be off on the wrong small foot shortly after stepping across the sill of the doorway to the Oval Office. He has neither the experience nor temperament to be in a position of such power and responsibility. Being a good businessman does not qualify one to be president, for there is so much more required to fill such a position than is part and parcel of running a normal business. Diplomacy, leadership, and an innate understanding of politics are a few of the arts that are not required to the degree in business as it is in the office of the president of the United States. 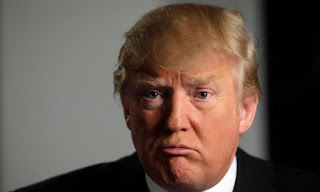 Move on to a list of Trump's business failures -- a long one, as frequently introduced in Facebook posts -- and his oft reported, ah, less than truthful statements and claims, along with his confrontative and bullying manner, and it is easy to verbally demolish the man. Of course, he is only demolished in the mind of the one doing the demolishing. He is, apparently, unaffected by the abuse. Everything seems to bounce of his emotional armor. Still, I feel sorry for him. Why do I feel sorry for the man who is making a mockery of the highest process of American politics? Because he is the product of his birth, his culture, and his DNA which produced his body and brain. He is what he is because of "nature and nurture:" the environment, culture, and his DNA. This is not to say we should give the man a pass. Everything he has ever said and done is fair game, along with everything he didn't say or do that he should have. 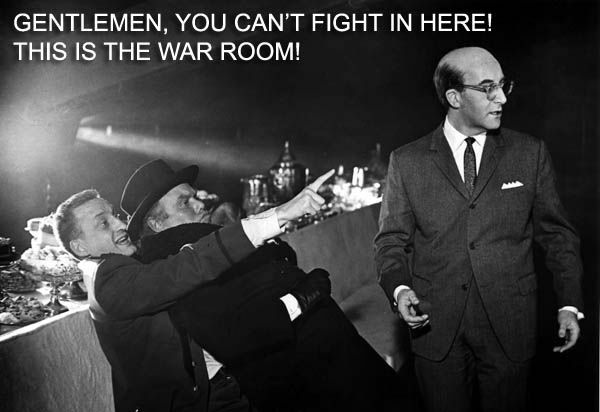 When you step into the vicious arena of politics, you do so of your own violation, and bear the brunt of the sticks and stones, make that the limbs and boulders, that are heaved upon your person nonstop. Sarcasm and artfully insulting humor are what you invite when you accept the challenge, and place the target upon your political breast. My empathy for Trump comes, first, from the attacks being so personal, and because they include his family. Of course, this is true for Clinton, Sanders, Obama, and pretty much anyone and everyone who steps into the contentious political spotlight. But that doesn't make it right, and I have empathy for them as well. The other, and primary, reason I feel sorry for Mr. Trump is the life which he leads. "You mean a life of having so much money you can't lose it fast enough to go broke? You mean having houses in beautiful places all over the globe? Or maybe having all those rich and famous people faun over you and cow-tow to your every whim? Or maybe the one in which a long line of beautiful women throw themselves at you? That one?" Well, yes. It has been scientifically proven that once one achieves Maslow's Hierarchy of Needs (food, shelter, etc. ), an increase in wealth produces no increase in happiness. Please answer this question: would you rather be rich and unhappy, or not rich and happy? I don't know for certain, of course, that Mr. Trump is unhappy, but I question whether anyone could be uncaring, dishonest, pugnacious, and brutally insulting as he is, and be happy. I feel sorry for Donald Trump because, as a product of birth and culture, he is likely a very unhappy man. And I would not want to live his life. I suppose I'm writing this defense for all of us Facebookians that spend a good bit of time reading newsfeeds, perusing comments, and clicking down lists of notifications. And, perhaps, to enlighten one or two unbelievers into giving it another look (I know that smacks of religion, but I attend to Facebook religiously). So here are a few reasons I spend so much time on Facebook. This is not applicable to everyone, but if you are not retired, the other reasons may appeal. We all need to exercise our brain muscles just like the other muscles in our bodies. This has been proven over and over, which is so easily found with Google, I'm not going to bother listing proofs here. Watching television is entertaining at times; educational, less so; and mind-numbing, mostly. On Facebook, I choose what to read and not to read, and what I do read is entertaining (more on that later), and educational now and then (more on that later as well). Facebook is a literary brain exercise machine. The posts are often genuinely provocative and thought provoking, but the comments are often equally stimulating. A few stimulate me to throw up, but most cause me to dig deep into my belief system, and consider the information offered in a new light. Some posts are patiently offensive. Some are particularly patiently offensive. While I am occasionally repulsed and/or mystified by the mindset displayed, I also use that opportunity to attempt to see how they come to that place. It is a virtual exploration as I have no idea of their cultural, spiritual, and hereditary backgrounds, but, if I can place myself in that virtual place, I can temper my response and broaden my receptivity to understanding that which is occasionally vulgar, offensive, even repugnant. Some posts enlighten; some elevate and encourage; some truly touch me. But all the posts I read, even those that, at first, spike a rise in blood pressure, gift me with some new understanding, feeling, or approach to that which is other than agreeable to me. I exercise my brain, my mind, and my ability to take a higher road in response. I have laughed more, longer, and out-louder, than I have on a consistent basis with any other medium. It's true, you have to kiss a few frog posts in order to get close to some good stuff, but it's worth it. Besides, you get really good at scanning, using Facebook. The icing on the frog, as it were, are the links. I have been frequently guided to truly interesting articles and other material through Facebook links posted by others. If I need a good laugh, I go to my favorite posters of humor. Love to laugh it up. It is a good place for those with special interests. There are daily videos on things that I like; cool cars, outrageous motorcycles, and World Rallye racing, which is like motocross for cars. And Dave Barry, my Humor Hero. I have learned a lot about history, politics, the bird and bees (no, no, the actual birds and bees), and odd creatures that inhabit our world, such as Trump supporters (I know, that's a cheap shot, but it's my blog. Mr. Trump can say whatever he wants about me on his). I will acknowledge that it is mostly a rather cursory incursion into whatever interesting subject is at hand, but that is just perfect for me, as it quickly reveals itself as something into which I want to more deeply delve, or if a shallower understanding is sufficient. Of course, they aren't really friends, are they? I have, in most cases, never laid eyes upon them, never stood or sat in their presence. That can't be real friendship, can it? Well, if it is not, that does not bode well for those who have impaired sight. Yes, they (possibly you) are real friends. Friendship is a matter of the mind and heart, not of proximity. People I've never met, Bill, Dave, Aurora, Andrea, and many more, I count as friends, and, having experienced their hearts as they have sometimes poured them out into a Facebook post, feel close, and a real connection. Then there are the people I have known and loved through the years that I have not seen in years, and may never see again; Diane, Christine, Sharlene, Linda, Mary, and so many, many more. And yes, I know those are all names of women. Eat your heart out. My life, especially now, when and where I am, is so much richer for knowing my Facebook friends. There are many other good reasons for spending time on Facebook, but this one, this last one, is the best of them. Dear Facebook friends, I am so grateful for you. 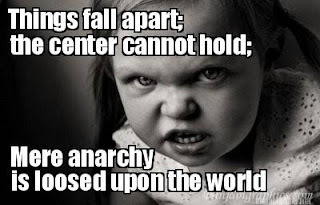 That pretty well sums it up, I think, having watched for some time the circus of anarchy that has been our politics. David Brooks, PBS News Hour commentator, recently wrote an opinion piece arguing that politics is the art of compromise, and that we have been moving from the political to the anti-political; from compromise to controversy; and continue to do so. He is correct, and we are moving in that direction with ever increasing speed. Politics, and its child, compromise, have become dirty words. I believe the center is where we need to be, rather than at the shrill extremes of hate, threats, and vile attacks on the part of both left and right. The framers of our constitution knew this, and constructed it in a manner which discourages the extreme, and encourages moderate governance. If we value our constitution, we must value it's most basic aim of moderation though compromise as expressed through, yes, politics. During the months leading to the election of the person who will guide – or misguide – our nation, I encourage to you listen with an ear directed to the center, and who will move that center through the best of our political process: that of genuine and compassionate compromise. However, you need not be limited to the grand national stage: you can practice the best of politics through compromise on your own personal stage of relationships and experience. You can do this in your own personal interactions with your family, friends, and especially with those who might seem to be your enemy. Set your goal, not to overwhelm and destroy, but to agree where you can. and aim for the best compromise where you can not. In this way, you dodge the bullet of your own mis-aimed extremes, and achieve at best a move of the center in the direction you desire, and at worst, the best outcome for which you could hope. In this way, personally and globally, we chain anarchy, stem the blood-dimmed tide, and help the center to hold. Lies and more lies. It seems that, in this disturbing and seemingly never ending political climate, lies, and accusations of lies, are all we've met. In speeches of every stripe, in the news, Facebook, Twitter, everywhere you look or listen, lies and accusation of lies are what you hear and see. Perhaps it's time to examine the nature of truth, which just might tell us why there is so much lying. There are two kinds of truth: absolute truth and relative truth. Absolute truth is absolute: it has always been true, is true now, and always will be true. Relative truth is your truth relative to your understanding of absolute truth. For instance, one absolute truth, at least for me, is, "love is always the best response." Responding in love is absolutely the best response, always, but the nature of that response is a relative truth depending on the belief systems of each responder. Each person who acts in love, acts according to their understanding of the absolute nature of love. Consider love expressed in parenting. Most parents would agree that love is the best response to their children. But what kind of response? Permissive love? Unconditional love? Tough love? Some believe that spanking is an act of love in that it teaches children respect and obedience, while others believe that spanking isn't an act of love, but rather one that only teaches violence, and reinforces violent behavior. Love is absolute, but choosing ways to practice acts of love is based on relative truth. The question is, "what does this have to do with the current climate of pervasive disingenuousness, and how can it help us do anything about it?" The answer is that the cause of virtually all that is troubling our world is rooted in the error of believing a relative truth to be absolute. "My religion is the religion of the One True God, and yours is wrong." "My political belief (choose one) is the right one, and yours is anti-American!" "(Fracking; gun rights; vegetarianism; socialism; cannibalism) is (un-American; the Only True American Way; a constitutional right; the harbinger of doom; post apocalyptic zombie cataclysm). Mix and match as your relatively truthful nature leads you. 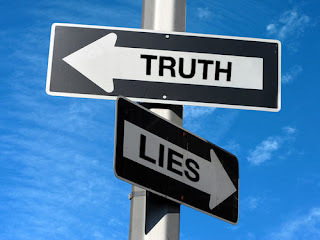 Unfortunately, when we believe we have the Absolute Truth on our side, we decline to listen to any other possibility, which leads to defensiveness at all costs, the taking of sides, and often the violent rejection of anything that jeopardizes the absolute truth of our position. Only when we recognize that virtually everything we believe is a relative truth, will we be able to actually listen to one another, and profit from the listening. And it begins with you and me. Why "Tour of the Univerese?" Why call this, "Tour of the Universe?" Mostly because I have no idea where this is headed. Which is the way I like it. If this were to be about politics, or religion, or the heartbreak of psoriasis, I would be stuck with paranoia, more paranoia, and/or skin disease. But this way, I can go anywhere. It will be a tour of the universe of my mind, and you can go with me. You have been warned. Perhaps it would be be best to start with a bit about my own self. I recently retired from some 30 years of ministry. I was a Unity minister, which places me on the somewhat conservative end of the liberal wing, a bit right of the left tip of New Age, and a bit left of some "fundamental" religious views. Ours is a movement which embraces all living, breathing, thinking people of all beliefs and backgrounds. If you are comfortable with us, we'll be comfortable with you. I intend this blog to be the same. My time as a Unity minister was a life-altering, mind-expanding, consciousness-straining experience. My experiences during those thirty years lifted me up into joy, tromped me down into despair, wracked me with doubt, and pulverized my long held views of the universe and my place in it. I will share some of those experiences, and what they meant to me in this space. Before entering the ministry, an absolute joy, and a soul twisting experience, if there ever was one, I was a photographer. I began my celluloid path accidentally. A mildly insane neighbor, Dave, after establishing a rapport of uneven mental processes, asked me, an avid Toastmaster member, to write stories to go with the photographs he took of local motorcycle races to be published in the local newspaper, by which he was employed as a photographer. I said, "What? Me? Write? I'm not a writer!" To which he replied, "You give speeches, don't you? Write a speech -- but don't give it. Give it to me instead." A bit of thinking outside of the box before we knew there was a box. So began my newsperson career. After a while, Dave decided I might as well take photographs as well, and he helped me buy a camera, and taught me to use it. So began my photographyperson career. I was truly fortunate to learn photography by the side of a man who would one day win a Pulitzer Prize. I went on to be a stringer (paid by column inch and per photo) for Cycle News West and Cycle News East (Used my first name for one, middle name for the other. Hey, I never claimed I had scruples. ), then on to edit St. Louis Cycle News, and, finally, editor and producer of Midwest Cycle News. Here, I did it all, being the owner and only employee. I took, developed, and contact printed some 40-50 rolls of Tri-X film a week, did the layout, type setting, took it to be printed, and then distributed it. I did this for about 4 years until stress and lack of sleep overtook my enthusiasm for the news business, and my bottled came uncorked. So, I left the paper to become a traveling portrait photographer. Years of Big Fun photographing various groups, families, couples, singles, and kids (fondly referred to by photographers as rug rats, linoleum lizards, curtain climbers, ankle biters, and other, less kind, nomenclature), made me an expert in mass relationships in posing, lighting, and packing a vehicle with more equipment than it could actually hold. It was a good thing I didn't smoke, because I had no room for matches. All these wonderful skills, of course, helped me not at all as a minister. However, since portraiture, properly done, is as much entertainment and people skills as photography skill, it was excellent training for the next, and last vocational installment in my life story: pastor to the people. My first real employment before meeting mildly deranged Dave, was as an investigator, which could supply enough stories to last a blog that would far outlive this blogger. Perhaps some of those will find their way here as well. During that time, I investigated a murder (shotgun blast for an insurance salesman in a telephone booth), and looked down the barrel of a chrome plated 38 pistol myself. You will be no doubt be glad to learn he didn't shoot me and I didn't die. Well, that's enough for this time; I can hear your eyes glazing over. Next time, my subject title will be, "The Truth of Truth." Unless it's something else.